Comments: The 3 3/4″ format scale is apparently where its at now in the industry. 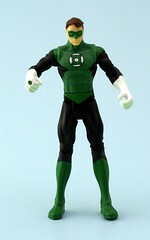 Green Lantern here is from Mattel’s 3 3/4 line. I’m rather fond of this Green Lantern as while he fits in with any modern toy, he does feel like a great update of the “Super Powers” Green Lantern figure. Green Lantern’s figure is a mixed bag, I’d say. The sculpt and deco are great; Hal’s not too beefy and the paint apps are, in general, clean. Hal’s power ring is a bit of a let down as it looks like a big blob of green paint, but at this size it was likely difficult to do anything other than that. Where the figure really falls short is in the articulation provided, particularly when compared to the modern Star Wars or Marvel universe figure. And while I generally think that super articulated causes more problems then it’s worth, Hal’s joints just seem to leave the figure lacking. Perhaps Hal just needs a pair of ankle joints, but as he is, he’s just a smidge underwhelming. Bif Bang Pow! announced Dexter SDCC exclusive…and a new scale!